In our current round of Bridgebuilders Seminars and in presentations about the Bridgebuilders Principles, we have been sharing some disturbing news that goes to the heart of renewing our passion for evangelism and making more and better disciples. As a follow-up, I’d like to share some graphs that summarize the recent findings of the Pew Research Center. 1. Realize that we are the seekers, not the religiously unaffiliated. Jesus told his followers to “go”. Instead of building a church building with the notion that “they will come” to us, we need to actively and intentionally go to our communities. 2. Target young people. 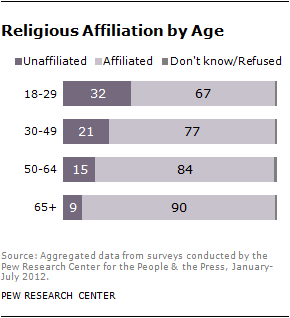 The younger generations are the ones with the largest percentage of religiously unaffiliated. They will also dictate the future of the church. Therefore, we need to intentionally seek to develop relationships with them. 3. Communicate the love of Jesus. If we share the love of Jesus by serving others with no strings attached and by being transparent with them, it will show them that we are more concerned with their souls than money, rules and politics. This is a repost from Justin Meier, church expansion specialist for the Churches of God, General Conference and pastor of my home church, First Church of God of Harrisburg PA.
Miami Dolphins fans recently had their hoped dashed when Payton Manning decided to sign with the Denver Broncos rather the Dolphins. Payton Manning has a house in Miami. He loves being in the city of Miami. Yet, despite Miami offering just as much money as Denver, he chose the Broncos. Reporters said that the QB was taken back by the Dolphins’ front office culture and that was the #1 reason he went to another team. You can have great online and offline marketing pieces that attract lots of people to attend your church, but if your culture is uninviting to guests… then those people aren’t coming back. No matter if you are utilizing marketing or not. Whatever your culture is at your church gathering determines a majority of the time whether or not a person will ever return. So if your church hasn’t been able to retain any of your visitors maybe it is a culture problem. Invite some people to come and be a critical eye of what is going on and see if you can change your culture. 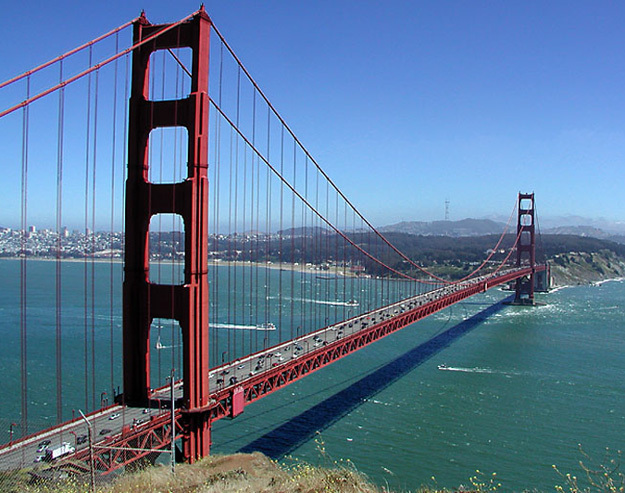 Bridgebuilders Seminar is a six-hour training seminar to help traditional churches reach their unchurched neighbors. The Seminar was designed by Dr. Steve Dunn on behalf of the Commission on Evangelism of the Eastern Regional Conference of the Churches of God. Part of the challenge of this effort is that it is often a cross-cultural experience for which traditional churches are ill-equipped by temperament, knowledge, and skills. Even if they believe that they are called to reach the mission field that is outside their front door, they often see it as a matter of getting people in the door so that the church might survive. And too often they believe that simply re-packaging a bit what they do will make them attractive to people for whom church is simply irrelevant to their daily lives. Seminars begin at 9:00 am and conclude at 3:30. Cost is $15 person or a flat $50 for churches registering four or more participants. That price includes lunch and a workbook. To date there have been three Bridgebuilders Seminars involving 20 churches more than 75 persons, plus two introductory seminars attended by 120 persons. Host pastor is Mark Hosler. Host pastor is Barry Stahl. You can register for Bridgebuilders by going to the BRIDGEBUILDERS SEMINARS Facebook Page or by going to ERC Evangelism’s website EVANGELISM PLUS Or by calling 717-898-8144. Adlai Stevenson stated, “That which seems the height of absurdity in one generation often becomes the height of wisdom in another.” He did not have a particularly high view of the next generation, but he does challenge us to consider the radical changes in thinking that are sometimes seen between generations. This bothers some and challenges others. For me, my concern is not to rail against the next generation– I want to reach them. In the book, “Lost and Found: The Younger Unchurched and the Churches that Reach Them,” I shared some of the findings from a survey conducted of 1,000 unchurched young adults about the issues of church and spirituality. The study revealed that the younger generation is more open to issues of spirituality than our conventional wisdom allows us to admit. This generation is open to God and spirituality. When asked if they considered themselves to be spiritual, 73 percent of respondents age 20-29 answered affirmatively. They are interested in learning more about God or a higher supreme being. Eighty-two percent believe a person’s spirit continues to exist in some kind of afterlife. Seventy-seven percent believe in the idea of heaven and 60 percent believe in the idea of hell. Perhaps most surprising, 66 percent even believe that Jesus died and came back to life. The Jesus that they believe in, however, is in some ways a Jesus of their own creation. Only 57 percent believe there is only one God, the God who exists in the Bible. Fifty-eight percent believe the God of the Bible is the same as the gods or spiritual beings of other religions. Though Hinduism ascribes to a million gods, Buddhism has no god, and Christianity has one God, a majority of young adults believe that all of these gods are the same. While there are clearly negative implications to this pluralism, there are also great opportunities for the church. Sixty-three percent said they would attend a church that presented truth in an understandable way. We need to be proactive about sharing the gospel to this demographic in clear, understandable terms. Simultaneously, we should defy the “Chicken Little syndrome” that believes the church is about to crumble under the weight of pluralism. It’s easy to look at some of the viewpoints of the younger unchurched and write them off. Rather than throwing up our hands in disgust, we need to extend a hand, exemplifying Christ and His gospel now more than ever. We need to enter into authentic relationship with a generation filled with brilliance and potential. We need to begin honest conversations with those who have honest questions. You can read more about our research on the millennials here, and you can subscribe to Facts and Trends by emailing factsandtrends@lifeway.com. This video on YouTube is from a broadcast called The Greatest Story Never Told and features research from Lifeway, an arm of the Southern Baptist Convention. Ed Stetzer adds his analysis.